Optimal weed management is generally achieved when robust cropping systems are employed and herbicides are applied only as required. Knowledge of soil, crop and weed interactions can be viewed as an input which is not purchased from a supplier annually but is accumulated from personal experience, research and other producers. 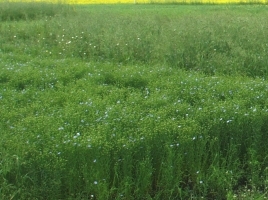 This document contains a summary of information on optimal weed management strategies which have been evaluated in western Canada. The purpose of this document is to bring together information related to reducing herbicide use and make it accessible to farmers and those advising farmers on their cropping practices. It offers practical suggestions and ideas that can be used independently or in conjunction with other practices, for those who are taking first steps in herbicide reduction and for those who are ready to eliminate herbicides altogether. The CD outlines a wide range of weed management options which reduce the risks associated with pesticides. These options have been grouped into several main sections as outlined below.